Part of the American Diner traditional lighting collection. Simple and classically styled antique brass single wall light, with clear ribbed glass shade and pull cord on / off switch. Can you tell me the diameter of the part that fits to the wall. 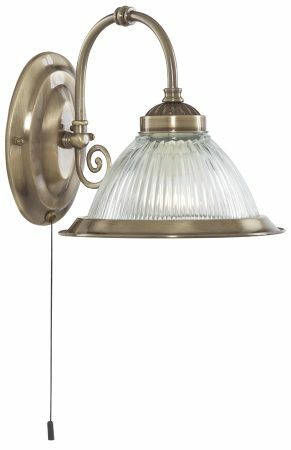 I am looking for a replacement light that was 10cm diameter so need that size or bigger. The width of the backplate on this wall light measures 11cm. This light can be used on a dimmer switch. If using LED bulbs, you will need to ensure they are a dimmable type, and you are using a specific LED compatible dimmer.